Most grocery stores carry travel-sized version of all daily use liquids – hair gel, shampoo, etc. TSA also points out that under the “liquid medication” provision, one can carry more than 3 oz. (ounces) of liquids with them, for example – contact lens solution. 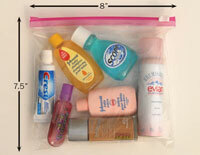 This caveat allows for liquids to be packed in your carry-on bag as long as they are for a medical purpose. You also need to not put them in the usual quart-sized bag and should declare them to the security officer when you go through security. Frozen items are allowed as long as they are frozen solid when presented for screening. If frozen items are partially melted, slushy, or have any liquid at the bottom of the container, they must meet 3-1-1 requirements. For short trips, as mentioned in our tips, contact lens cases with screw-on lids make great container for small quantities of hair gel, eye make-up remover, or oils for one week’s worth. They’re small and they don’t leak. For more information see Travelers with Disabilities and Medical Conditions on TSA website.